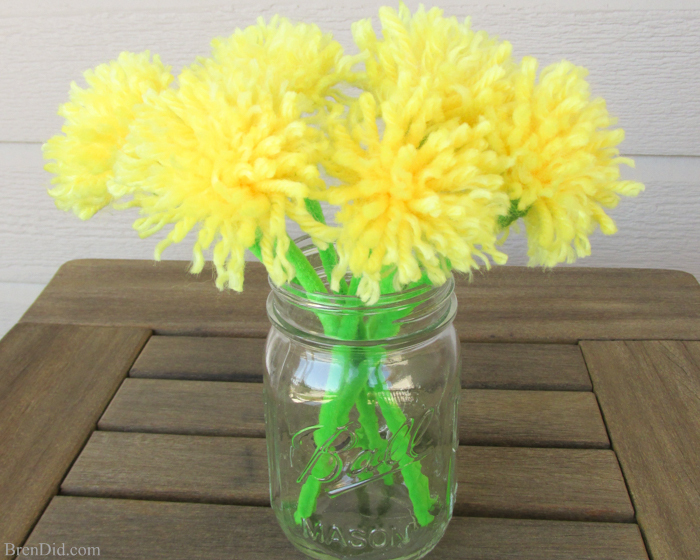 You may not want dandelions growing in your yard, but these pretty yellow and green dandelions are the perfect gift for Mother’s Day, birthdays, and rustic weddings. 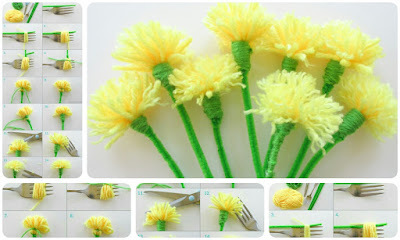 Tassels are easy to make with a fork. It may take you a tassel or two to get the hang of this technique. Don’t get discouraged, you’ll soon be a pom pom making pro! Place a pipe cleaner along one side of your fork. 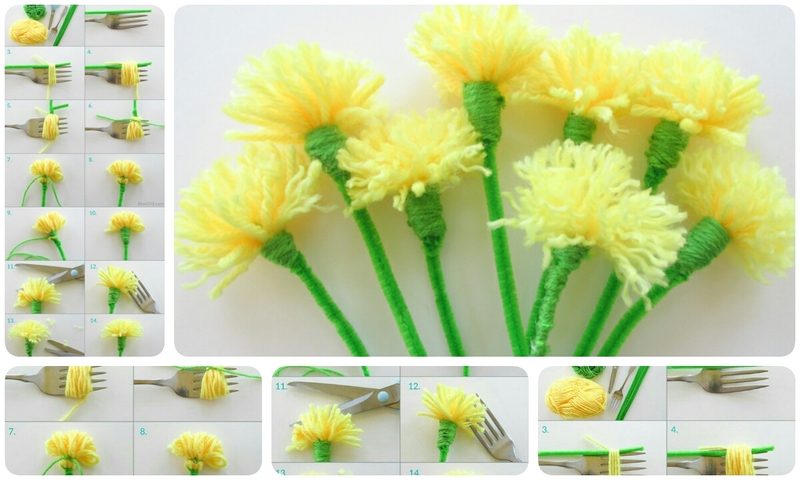 Wrap the fork and pipe cleaner with yellow yarn. Be careful to keep the wrapped area of yarn about 1 inch wide. Wrap the yarn 25-30 times around the fork. Twist the pipe cleaner together around the end of the yarn. Wrap it 3 times down the stem and then back up toward the flower ( you are forming the base of the stem). 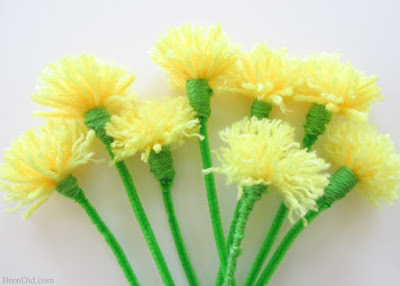 Cut a 4-inch piece of green yarn and tie it around the base of the flower (between the last tine of the fork). Remove the tassel from the fork. Not the green yarn tightly two (2) times. Trim the ends of the green yarn close to the knot. Cut a 8-inch piece of green yarn. Add a dot of glue near the green knot and attach the green yarn. Wrap the flower from the green knot down to the stem, wrapping the yarn close together so no yellow yarn shows. Wrap the green yarn until it is about 1/4 inch from the end, add a dot of glue to the flower base and secure the end of the yarn. Cut the loops of the yellow yarn with scissors. Use a fork or metal tool to fray the yarn slightly. Fluff the top of your flower and trim any stray threads.